New York-based English artist Anthony McCall is joined in conversation with art historian Anne Wagner. 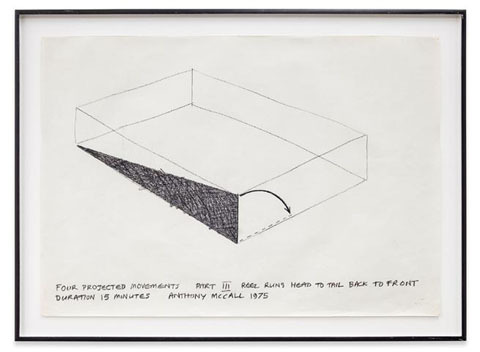 New York-based English artist Anthony McCall is joined in conversation with art historian Anne Wagner, author of a new essay in the recently published monograph, Anthony McCall: 1970s Works on Paper (Walther Konig, 2014). The pair will discuss McCall’s rarely seen drawings and photographs from the 1970s, as well as the relationship of those works to the performances and films he was also producing at that time. McCall’s practice represents an intensive investigation of the performative and sculptural potential of the medium of film. An important point of departure for his work is a series of Land Art performances which he developed in the early 1970s, includingEarthwork (1972) and the series Landscape for Fire (1972/74). Recent solo exhibitions include Five Minutes of Pure Sculpture, Nationalgalerie im Hamburger Bahnhof - Museum für Gegenwart, Berlin, 2012 and 1970s Solid-Light Works, Sprüth Magers Berlin, 2013; Face to Face, Sean Kelly Gallery, New York, 2013; Two Double Works, Kunstmuseum St Gallen, Lokremise, 2013; and Solid-Light Works, Les Abattoirs, Toulouse, France, 2013. An art historian, critic and teacher, Anne Wagner writes on a range of topics in 19th, 20th, and 21st century art, especially sculpture. Class of 1936 Professor Emerita at the University of California, Berkeley, she is now based in London where she is a visiting professor at The Courtauld Institute of Art. Her books include Jean-Baptiste Carpeaux: Sculptor of the Second Empire, 1986; Three Artists (Three Women), 1996;Mother Stone: The Vitality of Modern British Sculpture, 2005; and A House Divided: On Recent American Art, 2012.